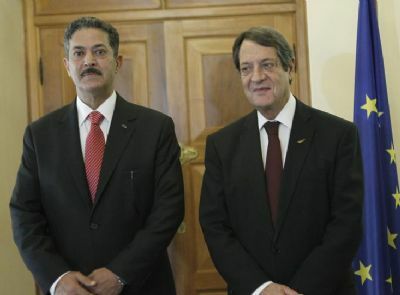 During a formal ceremony at the Presidential Palace, in Nicosia, El-Fayez presented his credentials to the President of Cyprus Nicos Anastasiades, and pledged to exert all possible efforts to further promote the already excellent relations, which Jordan and Cyprus enjoy. "Jordan’s positions have been always for the unification of the Republic of Cyprus" the Ambassador of the Hashemite Kingdom of Jordan has noted. He also said he was honored to be the first Jordanian resident Ambassador assigned to Nicosia. Receiving the Ambassador`s credentials, the President of the Republic expressed deep appreciation for the principled stance taken by Jordan in the discussions on the resolutions on the "situation in Cyprus" in various sessions of the Organization of the Islamic Cooperation. He further assured El-Fayez that the government of Cyprus will provide him with every assistance in performing his duties, and in establishing the first Diplomatic Mission of the Hashemite Kingdom of Jordan in Nicosia. "Over the last years, Cyprus and Jordan have been writing a new chapter in the history of our bilateral relations" the President went on, noting that relations extend now beyond the geographical proximity between the two countries and have a solid foundation in common aims and shared challenges. He added that the opening of the Embassy of Cyprus in Amman, in 2009, and the imminent opening of the Jordanian Embassy in Nicosia demonstrate the commitment of the two governments to further expand the cooperation between the two sides. Anastasiades also referred to the upcoming visit of King Abdullah II to Cyprus - scheduled for September 8 - noting that it will further enhance bilateral cooperation. The President added that the official visit he paid to Amman, in November 2015, "was a cornerstone in this respect", hammering out the final details for the Trilateral Cooperation between Cyprus, Jordan and Greece. "Jordan as a pivotal moderate Arab partner and Cyprus, together with Greece, as members of the EU are actively committed to bringing closer the Union and the Middle East. This cooperation is of tremendous strategic value and importance in our neighborhood" the President of Cyprus has noted. Moreover, Anastasiades informed the Ambassador on ongoing negotiations to reach a comprehensive settlement on the Cyprus problem, noting that there is a common understanding between the two sides on a number of important issues, although differences still remain. He went on, noting that the two sides have yet to hold any substantive discussions on two decisive chapters, namely territorial readjustments and security and guarantees, as well as on other issues. President Anastasiades appeared confident that challenges can be tackled during the current intensified round of the negotiating process, with discussions focusing on minimizing the gap on existing differences and pending issues, as well as on achieving progress on all issues that require a thorough discussion. He also reiterated his sincere willingness and determination to work tirelessly to achieve a settlement, but underlined Turkey`s vital contribution to this end. "There is no solution that can be reached without Turkey’s input"the President has noted and said that he expected Ankara to take concrete steps, taking into account the positive impact a settlement will have to regional stability and cooperation. The President of Cyprus also referred to efforts to restore the credibility of the Cypriot economy, noting that the country can be justifiably projected as a success story of economic reform. Anastasiades finally recognized the efforts of the Hashemite Kingdom to provide shelter to more than 1.3 mln refugees, while being at the forefront of activities to counter extremism as an essential Arab ally in the Global Coalition to Counter Daesh. "It goes without saying that Cyprus will continue to support Jordan at a time in which our core values are under serious threat" Anastasiades has said and pledged his support to King Abdullah’s “Aqaba Process” Initiative. Cyprus has been divided since 1974 when Turkey invaded and occupied its northern third. UN-led talks between President Anastasiades and Turkish Cypriot leader Akinci have been underway since May 2015, aiming to reunify the island under a federal roof.